Inexplicably, I woke up Friday morning with a serious craving for spicy green sauce. Of what variety? No clue. What would go in this sauce? Again, couldn't tell you. But I wanted a sauce, thick and green, spicy and fresh, to eat with salmon. And since there's only one cook in this house (D being capable of excellent cleaning and eating but really no cooking whatsoever, seriously), my craving was my command. I typed "spicy green sauce" into Google, and, you know, 16 MILLION results came back. So this spicy green sauce that I totally made up? It's a real thing. 16 million real things, to be precise. And then, because I'm terribly indecisive, I made three spicy green sauces. Hey - a craving is a craving, non? 9 chilies and two bunches of cilantro later, I found two versions that I really like. One I'll save for another time; the other is a perfect accompaniment to this simply roasted salmon. All the recipes I found varied on a basic theme: green chilies, cilantro and occasionally some parsley, garlic and/or onion, lemons or limes, and plenty of olive oil. If you were feeling creative, you could probably riff on the formula and create a sauce of your own. The one I made for the salmon was inspired by a Tunisian sauce called chermoula. The recipe came from David Tanis, who wrote one of the loveliest cookbooks on my shelf: A Platter of Figs. Its secret ingredient is preserved lemon, which imparts a floral note and plenty of brininess. We loved it on the salmon. 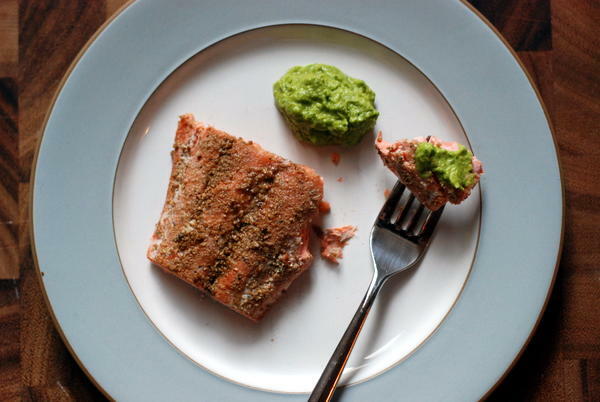 By the way, about that salmon: After many years of relying on wet, soggy marinades to do my flavoring, I've recently come around to the benefits -- and there are so many! -- of dry rub. First, who wants wet when you're dealing with raw chicken or a big slab of fish? It sounds like it'll get everywhere, and it does. Plus, even if you manage to keep the marinade contained, you're still left with a few cups of good liquid that you probably will just pour down the drain. Second, my sense is that marinades don't get much further than skin deep unless you leave them to do their work for several days, and by then -- at least according to Harold McGee -- you've actually altered the structure of the protein, which sounds scary and also not delicious. I'm not just a marinade naysayer, friends. I actually love dry rubs and I've been using them in all sorts of recipes lately. They're easy to make and remarkably economical. And since you apply the spices directly to the protein, you get a big hit of flavor from a relatively small volume of seasoning. If you play your cards correctly, as with this salmon, you get a nice, crunchy crust of seasoning on the outside of the fish, which really pushes things over the top. I used Tanis' mixture of coriander, cumin, caraway, and cayenne; the caraway is so unexpected and wonderful that I made a second batch of the spice rub (leaving the spices whole to preserve their flavor), and tucked it away for later use. The small bit of extra spice rub leftover from the salmon found its way onto eggplant, which I sliced, brushed with olive oil, and roasted in a 400-degree oven for 35 minutes until tender. The next day, I shmeared two slices of my sourdough bread with some of the leftover chermoula, piled on the spice-rubbed eggplant and some roasted cauliflower, and topped the vegetables with some feta cheese. A few minutes on the cast iron pan weighed down with the tea kettle (so MacGyver, right? ), and we had ourselves a killer panino. If I'd had any leftover salmon, I'd have added it to the sandwich in lieu of feta. The chermoula and spice rub are versatile components that I can see using in so many different ways. Both will definitely become part of the regular lunch rotation. Use pre-ground spices if needed; you'll wind up with slightly more spice rub, but no biggie. In a spice grinder or a mortar, grind the coriander, cumin, caraway, and cayenne to make a mostly-fine spice rub. Don't fret if little bits of whole spices remain. Place the salmon skin-side down on a large baking sheet and sprinkle all over with salt. 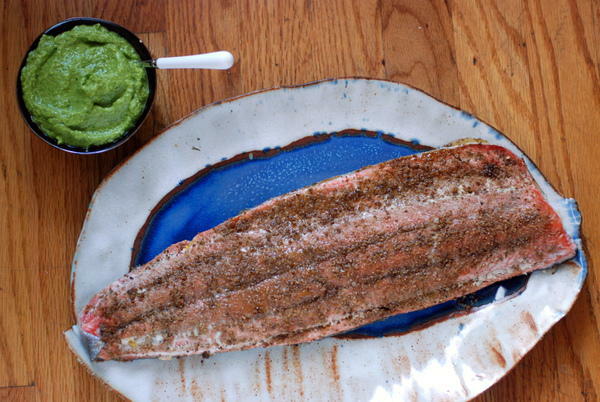 Then sprinkle the spice rub over the top of the fish, and use your finger tips to distribute the rub all over the fish. Don't be shy. While the fish cooks, make the sauce: combine all ingredients except olive oil in a blender. With the motor running, drizzle in the olive oil until everything emulsifies into a mostly-smooth sauce. Salt to taste. Transfer to a container and store in the fridge until ready to use. Either serve the salmon immediately, or refrigerate until thoroughly chilled (about 2 hours) and serve cold.